I have tried my hand at many a genre of photography but none have humbled me the way astrophotography has. A few weekends ago I happened to be free the same time we had a New Moon. This meant that I could actually have a care-free 24 hours to pack up all my gear and run away somewhere with less light pollution than my backyard. I opted for my good friend Ethan’s place in Auburn. An amazing artist himself, it was refreshing just to catch up with him. Another friend Jeremy came out at the last minute. He’d always wanted to explore Astrophotography so I figured this would be a good opportunity to share what I’ve learned so far. I stuffed my car full of everything I could think of – my entire telescope and mount setup (read more about that here) as well as my entire photography kit – and headed up the Auburn Hills to Grass Valley. I figured if it turned out to be a good showing, I wanted to be prepared. It was mostly cloudy but the forecast said it should clear up by 10pm, right when the sunset really ends, so I took my chance. Unfortunately the clouds and haze lingered all night especially in the Northern sky where it was darkest. The light pollution from the Sacramento valley was also much worse than anticipated. Combined with the haze it overpowered all but a few of the brightest stars. Finally around midnight the North Eastern quadrant of the sky cleared up. Due to the weather conditions I was only able to perform a very loose polar alignment as well as a poor 2-star alignment of the Celestron Advanced GT German Equatorial (GE) Mount. This resulted in poor tracking. However poor tracking on a GE mount is always better than a simple tripod. To compensate for this I chose to use the Canon 5D Mark III for its excellent high ISO low noise capabilities. 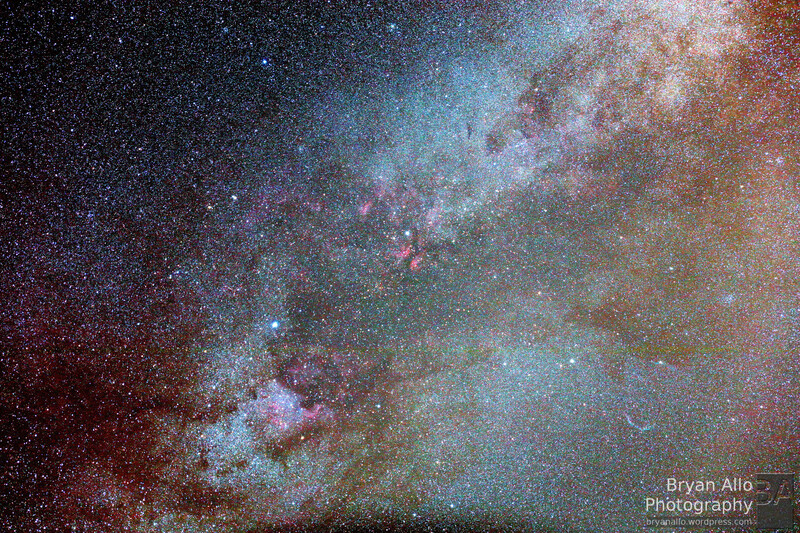 I mounted it (piggy-back) on the telescope and aimed at the clear part of the sky – the Constellation Cygnus. After just a handful of shots I realized that even with the poor alignment, I was still able to do 3 minute (180 second) exposures at ISO-400 without the stars trailing. I knew this was well within the capabilities of the higher pixel density sensor cameras such as the 7D Mark II or even better, the 5DsR. Both just happened to be laying idle in my bag. I had never tried the 5DsR at astrophotography and very much wanted to see how it performed. I liked how the 7D Mark II did and knew the 5DsR would at least match or exceed it since they have very similar pixel densities. Accounting for about 1 stop exposure difference from the 5D Mark III, I bumped the ISO to 800. Exposure stayed the same at 3 minutes. I was also shooting with the Canon EF 24-70mm f/2.8L II which I recently added to my kit. I knew it was tack sharp and would be able to keep up with the 50 megapixel body. Nothing prepared me for what I saw. I only took 4 shots and decided it was good enough. What you are looking at above is a single 3 minute exposure. Processed from a RAW file with no noise reduction, some color temperature and curve adjustments and a final light mask to help reduce the atmospheric haze. Nothing fancy not even lens correction (you can see some vignetting). The shot has bee downsized to about 1/12th it’s original size. At 70mm the detail is astounding. The light “clouds” are easily revealed to be individual stars. Mind-boggling scale and detail. It’s one thing to see images from the Hubble telescope, but an entirely different experience to see it for yourself. I’m not sure what took me so long, but it’s safe to say I will be spending several sleepless nights shooting the stars out in the middle of nowhere this summer.